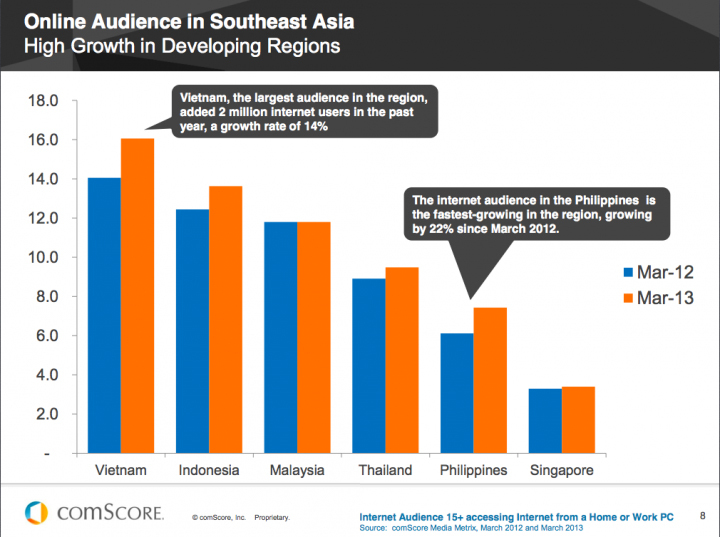 Vietnam has the most active internet population in Southeast Asia, according to a new report by US-based Internet analytic firm ComScore. The country had a total of monthly users to 16.1 million in March 2013, as per the latest available figures in the report, up 2 million from the same month in 2012. According ComScore, more than 74 percent of the 16.1 million active web population in Vietnam is under 35. The average amount of time spent online per day was 89.7 minutes and the average amount of pages viewed was 132.1. Social networking made for 21.6 per cent of online activity and entertainment was a close second at 19.3 percent of time spent online. Facebook has around 19 million users in Vietnam, as per data from the Social Media Global Info Center. Hanoi had the biggest share with 24 per cent, followed by Ho Chi Minh City with 21 per cent, Haiphong, Danang, Can Tho and Hue. The top seven entertainment sites in Vietnam Youtube, Zing MP3, Kenh14, NhacCuaTui.com, Ngoisao.net, Clip.vn and Vietgiaitri.com. Zing MP3 and NhatCuaTui.com are both music platforms. Online video viewing grew more than 14 per cent from 13 million viewers to almost 15 million.